A leading illustrator was among the headliners at a prestigious international comics event. 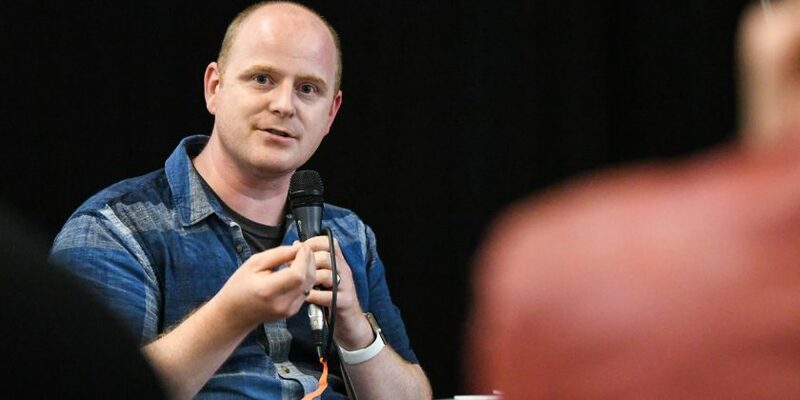 Dan Berry, Programme Leader for Illustration, Graphic Novels and Children’s Publishing at Wrexham Glyndwr University, was featured in a career retrospective at Helsingin Sarjakuvafestivaalit – Helsinki Comics Festival. It’s been a busy summer for the respected artist and author, who has also joined forces with David Gaffney to produce The Three Rooms in Valerie’s Head, an adaptation and performance of the Manchester writer’s stories, to be published by Top Shelf in January. Dan has also been hard at work creating a range of brass dip pens from his Shrewsbury home, which have already sold in bulk as he hones the design for a possible onslaught on the mass market in 2018. Combine this with his work at the University and family life, and it looks like being another frenetic 12 months, but he wouldn’t have it any other way. “Things have been rolling along quite quickly; the festival was another opportunity to talk about the comics industry and represent the UK,” said Dan. Dan has also played a pivotal role in the success of the Lakes International Comic Art Festival, held every autumn in Kendal, including the production and publication of a 24-page book in 24 hours. “The event takes place again this year from October 13, and looks like being the biggest yet,” added Dan. “It coincides with David and I receiving funding from the Arts Council of England to put together another book, on the back of The Three Rooms in Valerie’s Head. The BA (Hons) Illustration, Graphic Novels and Children’s Publishing at Wrexham Glyndwr University explores the full range of illustration techniques and applications from editorial artwork and children’s books through to comics and graphic novels. Emphasis is also placed on developing knowledge of the industry and the professional creative design process. For more information, visit the Wrexham Glyndwr University website. Read 1,172,947 times in last 30 days. Read 1,172,947 times in last 30 days, and 74,031,803 times since we started in 2011.